Buy some now by clicking the picture! “Butterfly pea”, is a tropical plant native to Southeast Asia and Madagascar. The flowers are often used as a food dye or dipped in batter and deep-fried. I like to toss a few in my salad. Some people say the seed pod is not edible and others say it is. I have not tried so until I do and survive will not recommend you eat the pods! You can grow this amazing beautiful and unique plant as part of your edible garden. Plant it near a fence or in a container with a trellis. The vine starts out slow, but then quickly climbs, and before you know it produces beautiful edible bright blue flowers. I have a bunch in the front yard as part of my edible landscape. Leave a few flowers on your plant and when pollinated they will produce brown seed pods for you to propagate from. 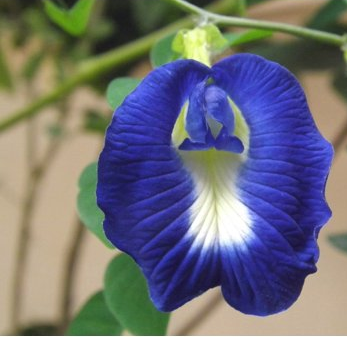 Butterfly pea vine is in the Fabaceae family and is an excellent nitrogen fixing plant. Butterfly pea flowers have color changing abilities! Brew the flowers in hot water (or soak in alcohol) for a bright blue coloring effect and then add lemon juice to change the blue to pink! Bartenders are big fans of the flowers and the dye created from them. Never over water Butterfly Peas! Pinch regularly to induce bushiness. Grow as an annual everywhere else. Propagate by seeds in the spring. They start slow but then speed up quite a bit as weather warms. Fertilize weakly weekly with balanced organic fertilizer at half strength or monthly during the growing season.